While recovering from the flu I found myself obsessing more and more about this ultralight house concept. I also began researching other unrelated ultralight topics like ultralight backpacking. I guess seeking extreme examples of less is more is just a fun to noodle over; but I have to admit… I think I’m developing a bit of an obsession for ultralight design. It could be a temporary condition though… I’ll keep you posted. The last design proved that for a tiny house to be truly ultralight it must be built more like a travel trailer than a house. The disadvantage of this approach is that as the walls get thinner and lighter the house becomes less suitable for 4-season living. It also gets a bit harder to build with easily obtained and inexpensive building materials. You could use aluminum, titanium, carbon fiber, and other composite materials but that tiny house might cost a fortune. Since I’d rather present ideas that are low cost and easy to implement I chose to stick with common building materials for this version. Imagine a wall system that starts out as a 2×4 and 2×2 frame. To that is glued and screwed an exterior layer of 1/2 plywood or OSB (oriented strand board). To lighten that heavy layer of plywood big sections would be cut out, but in such a fashion that retains much of the strength. Then a 1 1/2″ foam board (R-9) is glued into the cavities. To seal the interior side of the wall a thin layer of wall paneling is glued and nailed into place. The total wall would be just over 2-inches thick and have an insulation value of about R-10. Additional reflective layers of insulation could also be added as well as layers or house wrap to help seal up the walls. The exterior would be covered with lightweight metal roofing panels, like standing seam roofing or corrugated panels. The floor would be as thin as the walls since the trailer provides a firm flat platform. The roof would be a bit thicker with a full 3 1/2″ space for insulation. The trailer would still measure 6′ by 10′ making the interior floor space about 55 square feet. What I’m not sure about is if this approach would really be strong enough to hold up to regular highway travel. I bet with the addition of metal bracing (hurricane/earthquake straps) it would do fine but I’m not an engineer so I can’t be sure. I also want to thank all the folks that provided all the links to cool trailers and suggestions for making the house lighter. I was really blown away by all the great ideas that the original design concept elicited from our wider community. I’m going to try to step back from my growing lightweight obsession for a moment now and finish the 12×24 plans. I know there are a lot of people waiting for those plans. This entry was posted in Design Concepts and tagged tiny house, trailer, ultralight. I still would have gone with the horizontal orientation on the siding, though I doubt it would have made much difference on the weight. 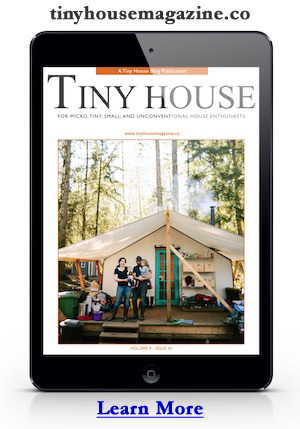 Also had you considered using the lightweight panels from Sing Tiny Houses? I don’t know enough about the specs but from what I’ve seen at their website, it might be something to consider. Might save some weight with the shed roof also, wouldn’t need quite so much frame, though if you go front to back orientation, I’d have the low side at the tongue end. Anyway, just some thoughts to get some conversation flowing on it. I believe the Sing panels are very similar to these, sandwiched layers of exterior grade plywood, rigid foam, and interior panelling. So there isn’t much difference. I’m sorry Michael, I didn’t mean to create an obsession. After a couple of days with no input I was just trying to incite some commentary. That worked well. I actually did my last note with humor in mind but I’m a tad limited on what I can set up in this forum. More a case of my limited computer skills and the lack of the extras I have in my email setup. Hard to show my twisted sense of humor while merely typing, Oh well, I’ll get over it. Like your site. I think this system is great! I’m using the same thing for my eventual vardo. Only difference is that I’m using the full sheet of plywood for shear and painting it, not using any metal siding. Some 1×3 furr strips on the outside will be lightweight and give it character. Be aware when using foil materials for heat reflectivity. You need a 1/2″ air space for the foil to actually work. This might be detrimental space in such a skinny wall. For a little more shear, consider diagonal metal shear strapping against the inside of the framing before you apply the interior veneer. Speaking of interior, I had thought about using 3/16″ luaun as a thin lightweight material. It is a little bit eco-aggreesive though. Thermoply might be a good idea with the foil facing outside. Anyone try cardboard with a semi-gloss paint for interior finish? It’s used in dry climates in lieu of gypsum/drywall. Cardboard is pretty common for material accessibility. Not as nice as a pine finish but it’s ultra-lightweight. As for framing weight – steel studs all the way using pop rivets to fasten it together so it doesn’t come apart during transport. The rivet gun can be picked up for $30. It looks kind of like a staple gun. I know people keep saying thermal problems – but to set the record straight it’s not a problem in Canada and we get pretty cold weather here. Applying an extra inch of foam insulation between the exterior plywood sheathing and the exterior finish will eliminate any thermal bridges and beef up your R-value that much more. You can use strapping/z-bar and screws/washers to hold the foam on. Use glue with the screws for that part. RSI (R-value) calculations on a steel stud assembly vs. wood stud are calculated using the National Energy Code. While steel conducts heat more than wood alone, the overall wall assembly conducts less due to the lower framing:insulation ratio. build ultralite steel framing steel siding or wood floor trusses I-joist 1×1 with 1/4 Plywood or 1-in x 4-in wood .ford truck f150 2013 trailer weight 11,300 It be nice to see a ultralite. Hello! My name is Jessie, and I have to comment to let you know that your images and posts have helped me so much to understand what I am looking for on my tiny house building journey. I am building a house on a 10×8.5ft snowmobile trailer, and my car can only tow 3000 lbs, so the lightest way to create this tiny house is the best way. Plus I will be it for my final year in School in Minneapolis MN so insuring that it is warm enough in the winter is another part I am working on. Well I just wanted to let you know how helpful your posts have been. Thank you! Hi Jesse. I’d love to see what you come up with! Hi all,I have been obsessed also with ways to build a light weight tinyhouse. I wander hiw many stayed awake late into the night designing the aluminum caravan! Without the internet…. Now we need reinvent it as a tiny house. I’m from Adelaide Australia and we are years behind you guys. Steel framing is not for the faint at heart.